Al Etmanski addresses delegates during the Summit's "Pause" presentation, a recurring feature that encourages attendees to think 'outside the box' and reflect on issues impacting their communities. Al’s presentation was entitled "The Sacred Headwaters of Social Innovation". 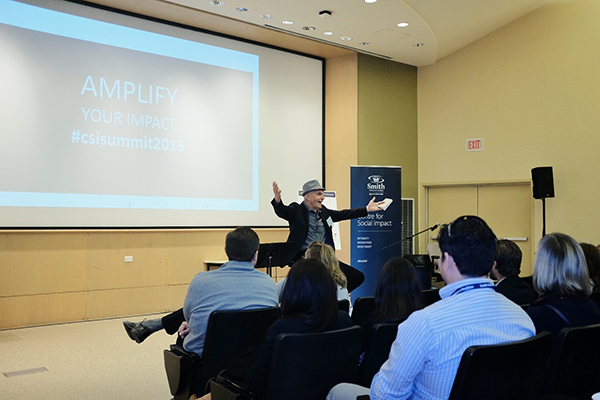 Kingston, ON - Oct. 23, 2015 - Nearly 200 delegates descended on Queen’s campus Oct. 16-17 for the 11th annual Social Impact Summit, organized by the Centre for Social Impact at Smith School of Business. 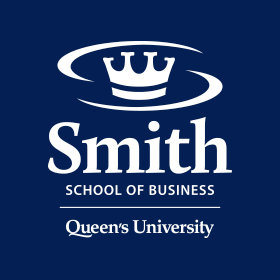 Attendees included Smith students and those of other Queen’s faculties, as well as members of the Kingston community and invited speakers from across North America. The conference offered many inspirational moments from such speakers as opening keynote presenter Harry Kraemer, former CEO of Baxter International; Al Etmanski, renowned community organizer, social entrepreneur and author; Vicki Saunders, of SheEO; and Jessica Bolduc, of 4Rs Youth Movement. Numerous plenary sessions covered a wealth of topics, including social finance and sustainability in the natural resource sector. A session entitled “Insights and Aspirations from CSR Executives” featured panellists from Social Impact Summit sponsors OLG, Coca-Cola Canada and IBM Canada Ltd.